Intermediate – familiarity with a jewelers saw is a must. In this class we will explore piercing metal. 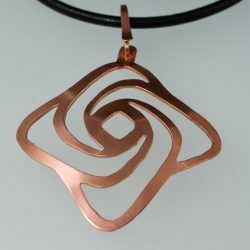 We will choose a piercable pattern, transfer to that pattern to metal, saw out the pattern, dome the piece using dapping punches, then create a pendant including a basic forged bail. Choice of several patterns, option to upgrade to silver at an additional cost. Instructor will provide limited tools for sharing. 3M sandpaper strips and size 3/0 sawblades will also be available.